and letters to the editor of the local newspaper to publicize this problem. Eventually, we sent a letter, signed by 50 cyclists from our community, to our County Supervisor requesting that the most dangerous gap of 0.7 miles in our bike lanes be filled. Following the letter we requested and were granted a meeting with the County Supervisor with 50 cyclists in attendance to emphasize our seriousness. He brought a County DOT manager to the meeting who admitted we had been promised this gap would be closed but maintained the funding wasn’t available. They promised the County would look into this and meet with us again in a month to report what could be done. Our group formed a committee, now known as the SCVBAC, and continued to meet monthly with the County DOT Engineering Manager and Project Manager. Preliminary plans were developed for review, but funding continued to be an issue. A lower cost solution was discussed, found mutually acceptable, and in 3 months the funding was made available. The project was a go! We continued to meet monthly to review and discuss progress. This key bike lane connection was completed in September, 2004, just 9 months after our meeting with the County Supervisor. This initial success was the beginning of a mutually satisfactory, cooperative relationship for safer bicycling between the SCVBAC, the County Supervisor, and DOT that continues today. Have a strong justification for your request, and build substantial community support. Take your case to both the political and administrative management of your Govt. Work cooperatively with Govt. decision makers and planners to discuss mutually acceptable solutions and reach consensus. Be persistent and continually follow up. If one approach or strategy isn’t working, find another. Request to review concepts, designs, and milestone schedules to best monitor projects. Get involved in public meetings and public hearings that might influence your objectives. Work with local newspapers to publicize your success and/or solicit community support. Work closely with your Govt. Bike Advocate so they understand and support your objectives. Network with other bike groups and advocates in your region to get their support. Don’t listen to the naysayers that say you can’t fight “City Hall”. We were fortunate in that we didn’t have to fight. We found that the Govt. people were pleased to hear what we needed. They actually want to find a way to do what the citizens want (within reason and practicality of course). Our great initial success was recognized by our local Green Valley Council who requested that we become a sub-committee of the Council and develop a master plan for future planning. This was good since we needed to now go after other gap closures. We convened a meeting of bicyclists, and developed a list of gaps which were prioritized according to our perceived judgment of their safety concern based on our experience riding them. This formed the basis of our “Master Plan for Lanes and Trails”, approved by our community and published by the Council in 2005. The plan shows both the most urgent projects recommended for improved safety, and also a projection to what projects will be needed in the future with significant population increases. Our Master Plan is updated annually and can be viewed on our website, www.scvbac.org. You can also view the many projects that have been completed and those underway. We have had 1-4 projects completed every year, and this year there will be 5 projects completed. This Master Plan is used to promote additional improvements in our community. It demonstrates that we have carefully thought about what we are currently promoting and how it fits in with other future projects. A local law enforcement officer participates in our monthly SCVBAC meetings. All jurisdictions in our region participate in our monthly SCVBAC meetings. We organize a “Ride of Silence” every May to emphasize to our community the importance of safety and to honor our fallen. We notify the appropriate authorities of safety problems, such as gaps in cattle grates, potholes, right hook jeopardies, etc. We encourage greater number of bicyclists by creating a regional bike map, safe routes to schools, bike events, etc. All of this is on our website. We have SCVBAC membership in all regional Govt. 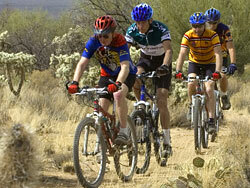 bicycle advisory groups, task forces, workshops, and bicycle facilities construction projects. We encourage cyclists to attend ribbon cutting celebrations to show our appreciation. Yes, finding funding is a problem and you need your alliances in Govt. to help. They know more about various funding opportunities than you do. Until the recession hit the jurisdictions had funding available for public projects that you had to compete for. If your project was a needed one, and you and your alliances could sell it, then you got funded (again within reason). So you had to be careful to not get greedy. Only ask for what you think is fair and justifiable under the circumstances of the time. We also applied for Transportation Enhancement Grants. We have won 3 so far. We usually draft the application with the guidance from our experienced Govt. Bike Advocate who then finalizes and promotes it thru the process. We are fortunate that the County voters approved a Regional Transportation Authority in 2005 that collects ½ cent sales tax for funding transportation for 20 years. The bicycle and pedestrian projects are $60M over 20 years. This funding was not intended to replace the normal funding from the jurisdictions, but because of the recession, it is currently most of our funding. We also encourage more people to ride their bike. Our website lists contacts for local rides and lists scheduled rides. We published a regional bike map showing our broad network of connected routes. In a little more than a year 9,000 copies have been distributed, and we are working on an update and reprint. Our local newspaper and Chamber of Commerce obtained sponsors and published the map based on our draft. 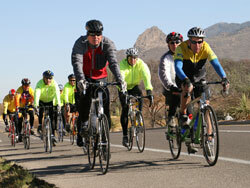 We also provide support for local Senior Games, Bike to School, and Bike Week events. Our SCVBAC success has resulted in more people riding their bikes which has provided immense satisfaction for us advocates. We have found great support and cooperation from our Govt. agencies and community, and greatly improved cycling safety and enjoyment. I hope our success inspires other communities that do not have a bicycle advocacy group to form one. You can find out more about SCVBAC at their website, www.scvbac.org .